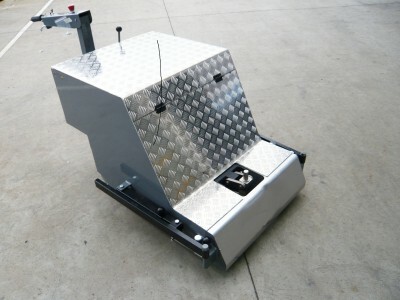 A heavy duty industrial tugger, mover, with lift function. Industrial puller with lift. A heavy-duty battery-powered tugger for moving up to 22,000 lbs with optional lift mechanism rated to 11,000 lbs. Low maintenance, simple to use. Production: Moving heavy vehicles, tools, and racks through production line including heavy carts, part carts, mother-daughter carts. 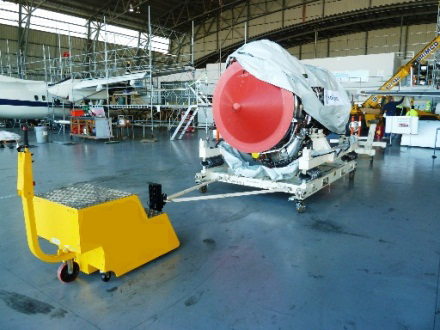 Maintenance: moving parts, equipment, trucks and engines in shop. Built with heavy industrial applications in mind, the Tug Tough utilizes a powerful 48V drive system to allow a single operator to hitch to and move big loads. 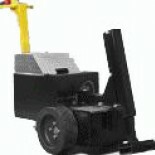 The fold-up tiller handle greatly reduces the space required for storing the unit. The Tug Tough incorporates all of the features you would expect on a quality product, D.C. geared motors, a high capacity programmable controller, forward and reverse drive controls, variable speed control, automatic electromagnetic park brakes and emergency brake release.